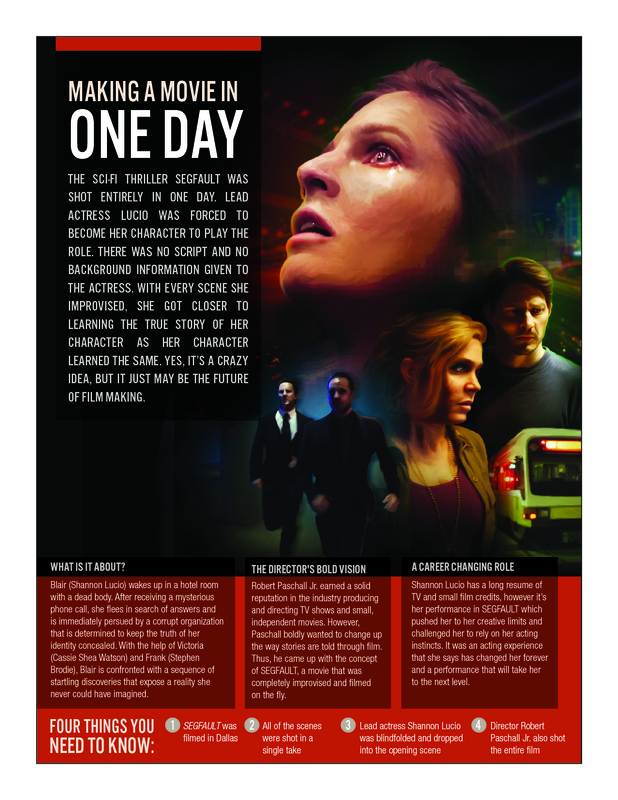 THE SCI-FI THRILLER SEGFAULT WAS SHOT ENTIRELY IN ONE DAY. LEAD ACTRESS LUCIO WAS FORCED TO BECOME HER CHARACTER TO PLAY THE ROLE. THERE WAS NO SCRIPT AND NO BACKGROUND INFORMATION GIVEN TO THE ACTRESS. WITH EVERY SCENE SHE IMPROVISED, SHE GOT CLOSER TO LEARNING THE TRUE STORY OF HER CHARACTER AS HER CHARACTER LEARNED THE SAME. YES, IT’S A CRAZY IDEA, BUT IT JUST MAY BE THE FUTURE OF FILM MAKING. Blair (Shannon Lucio) wakes up in a hotel room with a dead body. After receiving a mysterious phone call, she flees in search of answers and is immediately pursued by a corrupt organization that is determined to keep the truth of her identity concealed. With the help of Victoria (Cassie Shea Watson) and Frank (Stephen Brodie), Blair is confronted with a sequence of startling discoveries that expose a reality she never could have imagined. Robert Paschall Jr. earned a solid reputation in the industry producing and directing TV shows and small, independent movies. However, Paschall boldly wanted to change up the way stories are told through film. Thus, he came up with the concept of SEGFAULT, a movie that was completely improvised and filmed on the fly. Shannon Lucio has a long resume of TV and small film credits, however it’s her performance in SEGFAULT which pushed her to her creative limits and challenged her to rely on her acting instincts. It was an acting experience that she says has changed her forever and a performance that will take her to the next level.